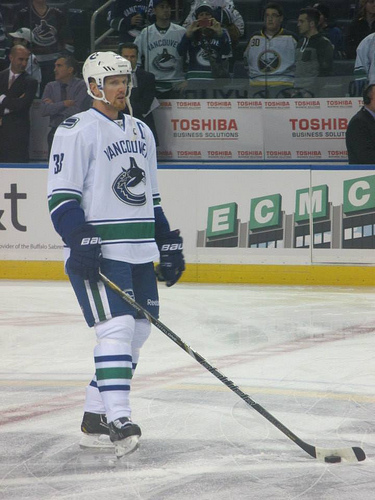 Vancouver Canucks Henrik Sedin, Photo taken by m_kania. Friday December 13, 2013, Edmonton Oilers at Vancouver Canucks at 9:00pm eastern time. This game will be the second game out of five this season between these Pacific division rivals. The first game resulted in the Canucks 6-2 victory over the Oilers on October 5th, 2013. Edmonton Oilers (11-19-3) head to Vancouver after a disappointing 4-2 home loss to the Bruins on Thursday. This bring the Oilers last 10 games record to 5-4-1. Playing away Edmonton isn’t any better than their last 10 games with an away record of 6-9-2. After the game against the Briuns, Coach Dallas Eakins had this to say. The first period Oilers was playing great. However, the last 10 minutes of the first period, Edmonton defense let up and allowed 3 goals. This was something the Oilers couldn’t come back from. In the 2nd and 3rd periods, Edmonton outscored Boston 2-1. This wasn’t enough to make up for the 3 goals in the first period. If they can get their defense in order in the first period, the Oilers can pull off a victory against the Canucks or at least make it a long game. Vancouver Canucks (18-10-5) is entering this game with a perfect record of 5-0-0 so far this month. The first three games of a five-game home stand that concludes with a visit from the Boston Bruins on Saturday added wins to the perfect December record. Vancouver last 10 games records lays at 7-2-1. This game is should be an easy victory given the Oilers can’t seem to play a stable game for 3 periods, losing away team, and playing back-to-back nights. My first thoughts were Canucks players had to much time off with 3 days of fun so the Oilers should be able to pull off a victory tonight but Vancouver is on a winning steak that they will not let off. At least not against Edmonton. Canucks are well rested, know what they need to do on the ice, and playing against the Oilers whom can’t seem to get it together long enough to win and have to play back-to back nights. This is a set up for the home team to win the game. I will be betting 1 unit on this game Vancouver Canucks with the moneyline.